Artist's concept of the Planetary Society's LightSail cubesat in orbit. LightSail suffered a software glitch shortly after its May 20, 2015 launch but came back online after about a week of silence. 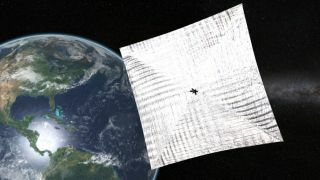 A tiny satellite has recovered from an apparent software glitch in orbit and is on track to deploy its solar sail as early as tomorrow (June 2), the spacecraft's handlers say. The nonprofit Planetary Society's LightSail spacecraft went silent on May 22, just two days after launching on a mission designed to test solar-sailing technology. Repeated attempts to contact LightSail were unsuccessful, and mission team members said they would probably have to wait for a fast-moving particle to strike the small cubesat's electronics gear in just the right way. "Our LightSail called home! It's alive!" Planetary Society CEO and former TV "Science Guy" Bill Nye said in a statement Saturday (May 30). "Our LightSail spacecraft has rebooted itself, just as our engineers predicted." LightSail appears to be doing well now, mission team members said. The spacecraft, which is about the size of a loaf of bread, has been beaming data home and capturing test images. "The deployment will be triggered during one of the first sunlit ground station passes of the day, when there are several subsequent passes over Cal Poly and Georgia Tech available," The Planetary Society's Jason Davis wrote in a mission update yesterday (May 31). "That currently works out to 11:44 a.m. EDT (15:44 UTC) [on Tuesday]. A final go/no-go decision is expected Monday night." Solar sails work by harnessing the subtle but continuous push imparted by photons streaming from the sun. LightSail did not fly high enough to do any controlled solar sailing on this mission. The craft will be brought down by atmospheric drag quickly — within two to 10 days, team members say — after sail deployment. But the test run should help prove out LightSail's attitude-control and sail-deployment systems, laying the foundation for a more ambitious orbital-sailing trial next year with a different LightSail craft, Planetary Society representatives say. LightSail and a number of other cubesats launched May 20 as secondary payloads aboard the United Launch Alliance Atlas V rocket that lofted the U.S. Air Force's robotic X-37B space plane on its fourth mystery mission. The glitch that temporarily silenced LightSail apparently originated in software that wrote information corresponding to the spacecraft's telemetry data onto a separate onboard file. Once this file reaches 32 megabytes in size, it can crash the flight system, Davis wrote in a previous update.